The history of Hickman County began before Tennessee achieved statehood in 1796. In April 1791, Edwin Hickman, a native of North Carolina, led a surveying party into what is now Hickman County. The first morning after their arrival, as Hickman and Robertson built a pre-dawn fire, Indians fired on the party, killing Hickman and wounding Robertson's hand. The party retreated to the Cumberland settlement, but returned several days later to bury Hickman's body. In December 1807, when the Tennessee General Assembly created a new county, then Representative Robert Weakley attached an amendment to the bill specifying that the new county should be named in honor of Edwin Hickman. In 1994, the Hickman County Historical Society placed a monument at Hickman's grave and built a fence around the gravesite. Average high temperatures in Lyles can reach 89 degrees in late July/early August, and average lows can dip to 26 degrees in January. Monthly precipitation averages 4.6 inches with about 9.4 inches of snow annually. Lyles is home to 6 public schools which provide education to all grade levels from kindergarten through the end of high school. Columbia State Community College offers the nearest higher educational resources from Columbia, 30 miles away. Other options available within 60 miles or less include Tennessee State University, Nashville State Technical Institute, Belmont University, Austin Peay State University, David Lipscomb University and Vanderbilt University. Baptist Hickman Community Hospital in Centerville and Horizon Medical Center in Dickson serve the area's health care needs from 15 miles away. Hickman County's retail community may be small in comparison to neighboring counties, but that does not prevent it from being broad and certainly colorful. Major employers in Hickman County provide the following products and services: ammunition, engine rebuilders, steel forgings, wholesale tractors, welding, shutters & blinds, general machine work, plastic packaging, skids & wood pallets, crossties and lumber, floral decorations, scaffolding, men's pants, wood chips, illuminated signs, structural steel/bridge decking, metal fasteners, forestry, cabinet making, custom cabinets and custom orthotics. Available industrial properties in Hickman County include: Shipp's Bend Industrial Park with 50,000 square feet building on 100 acres, Airport Industrial Park owned by the city with 103 acres and East Hickman Industrial Park located on Highway 7 with 42 acres. 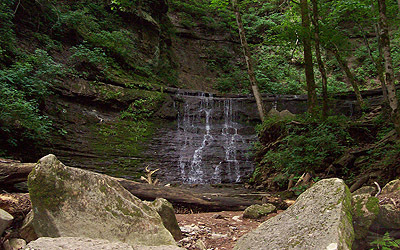 Natchez Trace is a national parkway lined with numerous historic sites and scenic spots such as Baker's Bluff and Jackson Falls. Consisting of 450 miles, this route runs through the southwest corner of Hickman County. The Old Grist Water Mill and Gordon House are some of the oldest structures still extant in Hickman County. The mill sits on Leatherwood Creek and is attached to a log cabin that was built by one of our first settlers when he arrived in 1799. Presently it serves as a spring water marketing operation. The Gordon House was built around 1817 by a prominent early settler and our first postmaster. The Duck River flows through our county...great for fishing and recreation! Pinewood Canoe & Camp, LLC have been in business since 1999. A campground and great swimming hole here on Cash Hollow Road in Pinewood. It is on the picturesque Piney River. Canoes and Kayak rentals every day of the week May thru September. 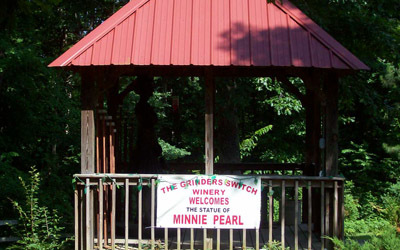 Located on a 110 acre estate in the small town of Centerville, TN, Grinder’s Switch Winery is a country oasis that boasts of some of the best wine in region. Wines have won awards and medals across the country including the prestigious “Wines of the South” competition. The vineyards and tasting room welcomes visitors far and wide and encourages guests to come and relax on the deck, take a walk through the vineyards or explore the surrounding countryside. The beautiful tasting room is nestled inside the cozy hand -built log cabin and offers an array of local handmade crafts and other unique gift items. Stop by today and enjoy the hospitality and the fantastic wine! Experience the small town comfort and historic flavor of Hickman County for yourself. Contact us today for more information - we'll be happy to help you in any way we can.